Work has never been as safe as it seems today. Safety has also never been as bureaucratized as it is today. Over the past two decades, the number of safety rules and statutes has exploded, and organizations themselves are creating ever more internal compliance requirements. At the same time, progress on safety has slowed to a crawl. Many incident- and injury rates have flatlined. Worse, excellent safety performance on low-consequence events tends to increase the risk of fatalities and disasters. Bureaucracy and compliance now seem less about managing the safety of the workers we are responsible for, and more about managing the liability of the people they work for. We make workers do a lot that does nothing to improve their success locally. Paradoxically, such tightening of safety bureaucracy robs us of exactly the source of human insight, creativity and resilience that can tell us how success is actually created, and where the next accident may well happen. 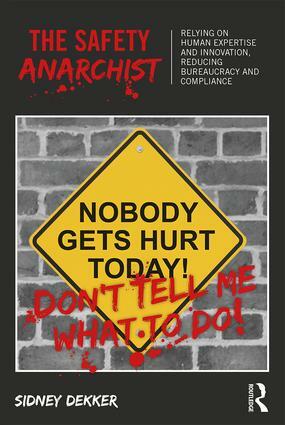 It is time for Safety Anarchists: people who trust people more than process, who rely on horizontally coordinating experiences and innovations, who push back against petty rules and coercive compliance, and who help recover the dignity and expertise of human work.